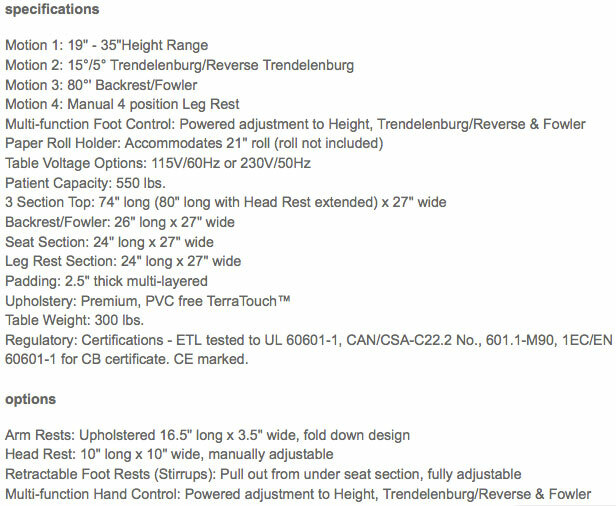 The high-quality Oakworks Medical and Spa Procedure Chair 100A Series exudes elegance, comfort, style and capability. It demands a commanding and powerful presence, yet is compact enough to fit into smaller workspaces. It is popular in MediSpa environments due to its versatility and ability to transition between all types of treatments. It is a helpful partner to a masseuse who needs to perform delicate procedures for every client's unique need. The reverse 20 degree Trendlenberg tilt is instrumental in the facilitation of maneuvering relaxing clients. It is a strong and sturdy chair that can handle higher capacity patients of up to 600 pounds. The high-quality upholstery on the Procedure Chair 100A Series comes in a variety of TerraTouch colors, including Butter, taupe, Pewter and Bluegrass. The durable finishes come in Acrylic Black, Grey, Beige and Cool White. Many products are provided by Oakworks, including various styles of Lift tables (including the Procedure Chair 100A Series), Stationary tables (with optional arm rest shelf brackets and table extenders), Portable tables and Wet/Dry tables. Helpful available accessories include carrying cases, bolsters, side lying positioning systems, table warmers, table carts, face rest pads, cushions, floats, table protectors, hammocks, arm rests and stools. Also available are trolleys which include hot stone warmers and attractive storage features. Oakworks products are found in MedSpas, Day Spas, Medical Aesthetic & Wellness environments, Hotel Spas, Resort Spas and Destination Spas. They have been chosen multiple years by American Spa Magazine as having The Best Treatment Tables. Oakworks is one of the largest and most in-demand manufacturers due to their high-quality products and satisfaction guarantee. They only use 100% polyurethane fabrics, 100% CFC- (chlorofluorocarbons) free foams and responsible hardwoods (certified by the Forest Stewardship Council). Whether customers are looking for easy-to-use portable massage chairs or the most sophisticated multi-purpose spa tables, they will not be disappointed in the construction and comfort that is offered. Oakworks strives to ensure complete satisfaction on every item sold. They have been in business since 1977 and take pride in the fact that they are based in the U.S. (Pennsylvania) instead of overseas. Their longevity is testimony to their innovation, work ethic and leadership. They also have a firm commitment to the well-being of their employees and the environmental health of our planet. Oakworks partners with Trees for the Future (a nonprofit organization that focuses on reforestation) and is a corporate sponsor of the Green Spa Network.